The "Mauritius Australia Connection" and "Recipes from Mauritius" web sites are the brainchildren of Madeleine and Clancy Philippe. 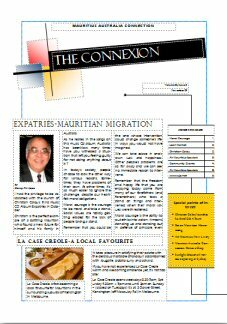 In 1994, when the internet started becoming available to the general public, Madeleine and Clancy Philippe saw the potential to use this medium to promote Mauritius and Mauritian Cuisine. 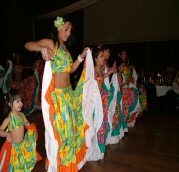 In so doing, they most certainly established two of the very first web sites to promote Mauritius and Mauritian Cuisine. The Mauritian Cuisine element came into the forefront after numerous requests being received from Mauritians scattered worldwide for recipes to cook Mauritian foods. Similarly, Australians after tasting Madeleine's cooking started asking for recipes. It must be added that Madeleine and Clancy are both passionate about Mauritian Cuisine and they have since been asked to contribute to the Foods and Drinks section of such publications as the Lonely Planet Guide to Mauritius, Rodrigues and Seychelles. In 1994, when Madeleine and Clancy settled in Melbourne after spending 12 years in country Victoria, they found that not very much was known about Mauritius and its cuisine. Many misconceptions existed, including the impression that Mauritian Cuisine involved an assortment of strange foods that included an assortment of greens, some of which are considered to be weeds. Some like brêdes martin were supposed to kill you if you ate it. Around the same time, Australians began to start appreciating ethnic foods from the different migrant communities that had settled in Australia. The Mauritius Australia Connection web site is now a Mauritian Community Portal web site for the Mauritian Community in Australia and by default of no similar website existing for Mauritian Communities in other countries, worldwide. The Mauritius Australia Connection web site receives in excess of 4500 visits daily and provides the Mauritian Community in Australia with a communication network that is accessible online 24/7. Its mailing lists reach in excess of 3000 subscribers. The Recipes from Australia section has established itself as the most popular Mauritian Cuisine web site on the internet. It consistently achieves top listing on search engines such as Google.